Scott Givens used to play with Legos, constructing intricate fantasylands. His building blocks are much more spectacular now — 7,000 live performers, tons of explosives, international rock stars, the world’s biggest stages — and his fantasylands are the stuff of worldwide television broadcasts. Givens (BSIE ’88) is founder and president of FiveCurrents, a creative and production firm that creates stadium spectacles. Its portfolio includes the opening and closing ceremonies for the Salt Lake 2002 Olympic Winter Games; Disneyland’s 50th anniversary celebration; Singapore’s 25th anniversary and Rio de Janeiro’s winning 2016 Olympic bid. His firm was recently appointed to create the ceremonies of the London 2012 Olympic Games. The job requires Givens to blend the efficiency and logic of an industrial engineering education with a lively creative mind as he works to pull off events of mindboggling proportion. “I have never really been good with ‘that’s acceptable,’” Givens says. His events are much more: over-the-top, breathtaking. His goal? To leave a deep and lasting impression on those who witness the show. 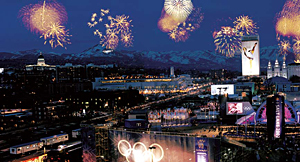 Givens and his team at Five Currents lit up the night during the 2002 Olympic Winter Games in Salt Lake City. His charge was to tie every aspect of the games to the theme, Light the Fire Within. Givens was also managing director of ceremonies and creative at the Salt Lake 2002 Olympic Winter Games, which meant he was responsible for the opening and closing ceremonies of the Salt Lake games, watched by a TV audience of more than 2 billion people. This included design and programming of the Olympic Medals Plaza and details ranging from the color palette and branding to design of the Olympic cauldron, built in glass to reflect the games’ theme, “Light the fire within.” For his work on the Salt Lake Games, the International Olympic Committee (IOC) awarded Givens the prestigious Olympic Order. Givens continued as a consultant to the IOC and helped oversee creative and ceremonies in Athens 2004 and Torino 2006. He also wrote the IOC manual on ceremonies and served as a judge during the selection of the emblems for Beijing 2008, Vancouver 2010 and Rio 2016. Event planning begins with brainstorming sessions involving creative, production and production logistics teams and a divide-and-conquer approach in which the event is broken down into components and tasks. Need someone who can stretch zip lines across a floodlit canyon? Givens knows the best rigging company in the world. “We sit in the eye of the storm and bring all the forces together. You take the elephant apart bite by bite,” he says. 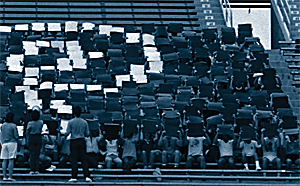 Above: Scott Givens began his journey to master entertainer as a student in the 1980s creating and directing Block P card stunts during football games. Previous page: The opening spectacular for the 2007 Rio Pan American Games in Brazil. Givens began honing his organizational and trail-blazing leadership skills early in life, first as class president at Westville High School in Muncie, Indiana, and then as the student representative to the Purdue Board of Trustees. (He returned to Purdue to share his experiences in the 2003 Old Masters program.) It was a sideline activity, though, that started his creative career. In an attempt to pep up Purdue football games — the team’s record wasn’t so strong in the mid-’80s — he founded a student organization in the fall of 1984 to perform card stunts in Ross-Ade Stadium. The group, dubbed Block P after the letter it spelled out, drew 600 students who sat just above the marching band and held up cards to create messages and images. 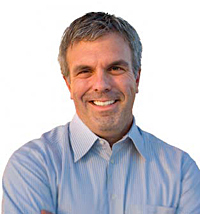 Givens, then a sophomore, planned out the designs using software he wrote for first-generation Macintosh computers that translated images into a seating diagram. As Rio de Janeiro competed to host the 2016 Olympic Summer Games, it looked to Five Currents to suitably impress the International Olympic Committee Evaluation Commission. 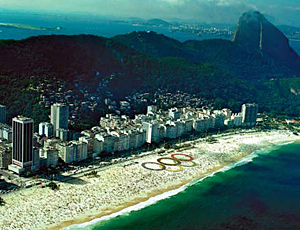 Entertainment during the commissions visit included more than 20 events and a beach bedecked with the Olympic rings. Rio won the bid. The card stunts drew the attention of Melvin Simon and Associates, shopping mall developer and owner of the Indianapolis Pacers basketball team. The company asked him to design card stunts for the NBA All-Star Game held that winter in Indianapolis. The next summer, Givens was invited to intern with Simon and Associates; he remained with the company through college, working primarily on shopping center openings. He continued his card stunts as a hobby business, Stadium Stunts, which focused on large-scale audience stunts and human formations. Around this time, Givens also worked on the Pan American Games, held in Indianapolis in summer 1987. In an interesting foreshadowing of his future, the opening ceremonies for those games were produced by the Walt Disney Company and featured 6,500 performers in the Indianapolis Motor Speedway. Twenty years later, after working for Disney, Givens and his own production company would serve as executive producer of the 2007 Pan American Games in Rio de Janeiro. Crossroads: Airline efficiency or shopping mall development? With graduation from Purdue came a significant choice: accept a job as an industrial engineer doing efficiency in flight scheduling for TWA or work for Melvin Simon and Associates as marketing director of a small shopping center the company was opening in California? He moved to San Jose. Givens pursued this left brain/right brain balance in business school at the University of Southern California. Not content to take a standard route, he crafted his own program, which straddled the business and entertainment schools. The result was a degree in business with a certificate from the cinema school that combined entertainment, sport, film and TV elements. The program still exists. In 2003, Givens joined Disney as vice president of entertainment. His dream job had come true. “I remember in college friends asked me what my ideal job would be. It was vice president of entertainment at Disneyland. Running a huge division, being creative. The fact that I got to do it at a milestone time in the company’s history is extraordinary,” he says. In 2005, Givens broke off to form FiveCurrents in Monterey, California. The company uses a variety of media to produce events ranging from the Clinton Global Initiative, an annual event in which world leaders from a variety of sectors come together to devise practical solutions to global challenges, to live sites for the Vancouver 2010 Olympic Games, to production of the London 2012 Olympic ceremonies.